Hurrah!! A snow day!! The world of Facebook was excited, the kids were excited, the teachers were excited!! Here at Louisa Fleet Recruitment … we weren’t so excited!! 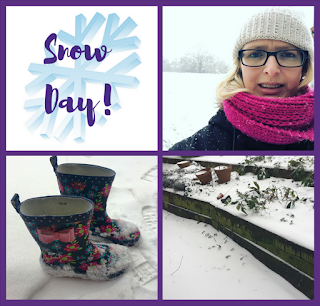 You see our team is mostly made up of working mums, so when the schools close we’re a bit stuck! Here’s a day (and a bit!) in the life of one of our team during the snowiest weather we’ve seen for a long time! Snow on the car, on the roads, on the pavement. Friends shouting from the rooftops that their workplaces, schools etc were closed. No such luck here. Our school is staying open. Traipse up to school in hats, winter coats, wellies and gloves. At least I would get a day of uninterrupted work done. Except that once I’d got them to school and got back home to start work, I then found out school was closing early. That meant squeezing a day’s work into a morning, making my apologies to a very forgiving boss and promising to make up the lost hours later! “It will all be ok”, I said, “because the school said they’ll be open tomorrow”. Plenty of time to finish the week’s work then! Kids home, all warmed up, I decide to finish off my work from earlier – that’s the joy of flexible working! I had planned to catch up on most of my work tomorrow, but tomorrow’s weather doesn’t look so good! Best to get a head start now! The text comes through – school is definitely closed all day tomorrow. “Hurrah…snow day” I hear you all shout! Everyone is happy that we don’t have to do yet another journey on foot through the snow to get to school! Cue me texting my apologies through again – the beauty of working from home is that I can still get most of my work done tomorrow – but it won’t be quite the same as it would have been! Tucked up indoors, watching the snow fall, glad to be in the warm this time! So we enjoy a day of family fun, watching the snow from the inside and working a bit more flexibly than usual! We all love a snow day! But it’s even better when the snow melts and everyone can get back to normal. I can’t be the only one who thinks that surely?! Do you want to work for a flexible, family-friendly company? We are looking for someone to join our team – if you’re in recruitment and you’re looking to get your work-life balance back please get in touch – we’d love to hear from you!